This article is about the men's team. For the women's team, see North Korea women's national football team. The North Korea national football team (Korean: 조선민주주의인민공화국 축구 국가대표팀, recognized as Korea DPR by FIFA) represents the Democratic People's Republic of Korea in international association football and is controlled by the DPR Korea Football Association, the governing body for football in North Korea. North Korea surprised with a good showing at their World Cup debut, reaching the quarter-finals in 1966, beating Italy in the group stage, being the first Asian team in history to make it past the group stage. During the 2006 World Cup Qualifiers, controversy arose when the team's supporters rioted, interfering with the opponents' safe egress from the stadium, because of North Korea's failure to qualify. In 2009, the team qualified for the 2010 FIFA World Cup, the second World Cup appearance in their history. North Korea has qualified for the AFC Asian Cup five times; in 1980, when they finished fourth, in 1992, 2011, in 2015, and in 2019. The current team is composed of both native North Koreans and Chongryon-affiliated Koreans born in Japan. In the 1966 World Cup, North Korea played their matches at Middlesbrough's home ground Ayresome Park, when the team caused an upset, beating Italy 1–0 to gain a spot in the quarter-finals. There, they lost 5–3 to Portugal, despite taking a 3–0 lead after thirty minutes. The North Korea team was the first team from outside Europe or the Americas to progress beyond the first round of the World Cup finals. In a 1999 documentary featuring interviews with surviving members of the team, they describe themselves as having been welcomed home as national heroes. The North Korea football team finished second in their group in the 1976 Summer Olympics, but lost 5–0 to Poland in the quarter-finals. 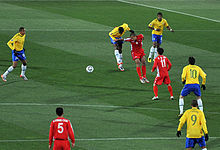 In March 2005, the North Korean team was playing Iran in Pyongyang when North Korean fans became enraged when the referee failed to award North Korea a penalty kick after a controversial play near the end of the match. Demanding a penalty, the North Korean footballers rushed Syrian referee Mohamed Kousa, who instead gave a North Korean player a red card. Bottles, stones and chairs were thrown onto the field following the play. After the match was over, North Korean fans refused to let the Iranian team leave the stadium on their team bus. The violence was so severe that riot police forced back the crowd. Following this incident, North Korea lost its right to host the subsequent home match with Japan and the game was instead played behind closed doors in Bangkok, Thailand. The North Korea football team qualified for the 2010 FIFA World Cup after finishing 2nd place in Group B of Asian qualifying. Their finishing place was not decided until the day of the last fixture of the group, in which they needed not only to avoid defeat in a match against Saudi Arabia, but also relied on Iran losing to South Korea. After the Koreans scored the same number of points as Saudi Arabia, North Korea qualified through goal difference. With a final pre-tournament FIFA ranking of 105th in the world, North Korea was the lowest-ranked team to qualify for the World Cup since the rankings began in 1993. 2010 was North Korea's first appearance at the World Cup since 1966. The draw placed North Korea in Group G. They played their first match against five-time winners Brazil on 15 June. Despite their best efforts, they were nevertheless outmatched and lost 1-2. In their next game against Portugal on 21 June, they were defeated 0–7. Despite starting well (as against Brazil), their defensive and well organised approach unravelled after Portugal scored on them. The Koreans lost their final match against Ivory Coast 0–3 on 25 June. Having lost all three group matches, they were knocked out, finishing at the bottom of Group G. It was reported that the small contingency of apparent North Korean football fans were actually Chinese people who bought tickets reserved for North Korean government officials. North Korea subsequently denied the report, and claimed instead that the Chinese were small in number, and that the regime had permitted their travel. There were also reports that the North Korean government punished the coach and players for losing the matches by sending them on a hard labour in mines. However, FIFA's investigators could not confirm that. The following players have also been called up to the North Korea squad within the last twelve months. As of 17 January 2019. Players in bold are still active at international level. Since 2014, North Korea's official kit provider is currently produced by the North Korean sports company Choeusu. ^ Montague, James (12 December 2017). "Inside the Secret World of Football in North Korea". Bleacher Report. Retrieved 3 January 2018. ^ "Voting Breakdown: The Best - Mens's Player 2018" (PDF). ^ "The Game of their Lives". BBC News. Archived from the original on 3 September 2010. ^ "XXI. Olympiad Montreal 1976 Football Tournament". rsssf.com. 15 June 2010. Retrieved 15 June 2010. ^ "N Korea football violence erupts". BBC News. 30 March 2005. Retrieved 7 May 2010. ^ Peck, Grant (15 June 2010). "No fans allowed at Japan, North Korea qualifying match". USA Today. Retrieved 15 June 2010. ^ "North Korea qualify for World Cup". BBC News. 15 June 2010. Retrieved 15 June 2010. ^ "World Cup guide – North Korea". BBC News. 15 June 2010. Retrieved 15 June 2010. ^ "Groups and Standings". FIFA. 15 June 2010. Retrieved 15 June 2010. ^ "North Korea revive World Cup memories". BBC News. 15 June 2010. Retrieved 15 June 2010. ^ Holton, Kate (15 June 2010). "Chinese 'volunteer army' arrive to back North Korea". Reuters. Pretoria, South Africa. Retrieved 13 July 2010. Indicating only that Chinese supporters of North Korea were present, but not necessarily excluding North Korean fans. ^ Frayer, Lauren (16 June 2010). "Diplomats: North Korean Soccer Fans Are Genuine". Aol News. Cape Town, South Africa. Archived from the original on 21 July 2010. Retrieved 12 July 2010. ^ Bobrowsky, Josef; Stokkermans, Karel (20 June 2007). "Dynasty Cup". The Rec.Sport.Soccer Statistics Foundation. Retrieved 22 June 2018. ^ Bobrowsky, Josef; King, Ian (1 January 2006). "Nehru Cup 1993". The Rec.Sport.Soccer Statistics Foundation. Retrieved 22 June 2018. ^ "Home-made Football Popular among DPRK People". KCNA. 1 July 2014. Retrieved 1 July 2014.